We present our Innovation Concept With Labyrinth Business PowerPoint Templates And PowerPoint Themes 1112.Use our Labyrinth PowerPoint Templates because, Getting it done in time is the key to success. 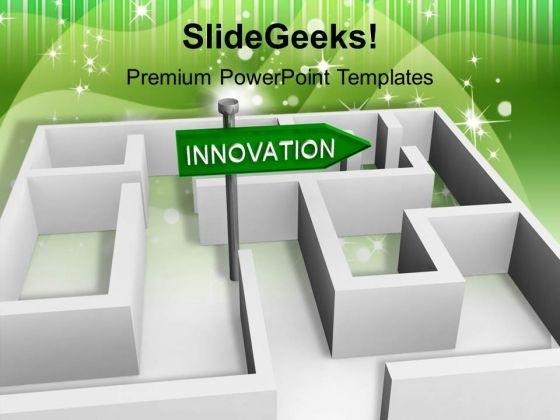 Use our Business PowerPoint Templates because, You understand the illness and its causes. Use our Success PowerPoint Templates because, Transmit your thoughts via our slides and prod your team to action. Use our Signs PowerPoint Templates because, Discuss each path to the smallest detail. Use our Arrows PowerPoint Templates because, Individual components well researched and understood in their place.Use these PowerPoint slides for presentations relating to "Innovation concept with labyrinth, business, success, signs, labyrinth, arrows". The prominent colors used in the PowerPoint template are Green, White, Gray Thwart problems with our Innovation Concept With Labyrinth Business PowerPoint Templates And PowerPoint Themes 1112. Download without worries with our money back guaranteee. Let your ideas spread like wildfire. Fan the flames with our Innovation Concept With Labyrinth Business PowerPoint Templates And PowerPoint Themes 1112.